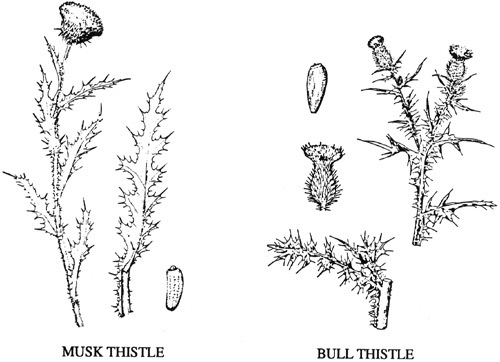 Control Practices for Biennial Thistles in Perennial Grass Crops, Botany & Plant Pathology, Purdue U.
Musk thistle and bull thistle are biennials causing major problems in perennial grass crops including pastures, roadsides, conservation reserve and fence rows. Biennials require portions of two growing seasons to reproduce. They grow from seed the first season as a rosette (a taproot with a cluster of leaves on the soil surface). The rosette overwinters and cold causes the rosette to send up a flowering stalk the next season and produce seed. Once seeds mature, the plant dies. Destruction of rosettes prior to flowering is an effective means of preventing seed formation and subsequent spread. Management of pastures infested with biennial thistle requires special consideration. Since biennial thistles reestablish from seed which is dispersed by wind, it is helpful to prevent seed formation adjacent to pastures. Also it may take two or more years of excellent control before seeds are reduced to the point that allows for legume reestablishment for pasture improvement. One year of poor thistle control will result in having to start the control program over. Most of the herbicides used for control of bull and musk thistle also kill pasture legumes. Spot spraying individual plants or patches rather than broadcast spraying the entire pasture also spares the legumes. Musk thistle normally initiates flower stalks in early May and reaches full flower in early June. Seed production is prolific and usually completed in mid to late June. Rosettes reestablish nearly any time during the growing season. Some rosettes may be three or four feet in diameter by late fall. Musk thistle is extremely aggressive. Bull thistle normally initiates flower shoots in July and reaches full flower in August. Seed production is usually completed in late summer. Rosettes reestablish during summer and early fall. The best time to treat biennial thistles with herbicides is in late fall or early spring when the rosettes are present but before flowering stalks are initiated. Musk thistle and bull thistle plants with seed stalks are more difficult to kill than the rosettes. Thistle rosettes need to be treated when they are actively growing and not under drought stress. The younger the rosette, the more susceptible it is to herbicide. One properly timed treatment per year should prevent seed formation. Several herbicides provide good to excellent control of thistle rosettes. Fall treatments should be made late enough to kill all rosettes germinated before winter. Late germinating rosettes that establish after early fall herbicide applications could flower the next growing season. Early spring treatments should kill all overwintering rosettes and those rosettes germinating later (spring and summer) should not produce seed until the following year. 2,4-D (Numerous trade names. Some of the more recognizable include: Esteron 99, Weedone 638, Weedar 64, Formula 40 and HiDep). 1 to 1 1/2 qt./acre. ALLY (metsulfuron) 1/4 to 1/2 oz./acre. Mixing with 2,4-D frequently reduces injury to pasture grasses. CROSSBOW (triclopyr + 2,4-D) 2 qt./acre where woody species are present. Plateau (imazapic) 8 to 12 oz./acre for Conservation Reserve, and wild flower establishment and other non-cropland only uses. Doses of imazapic PLATEAU that control thistle tend to severely injure tall fescue. TORDON (picloram) long soil-residual selective control in permanent pastures where brush control is also desired. ROUNDUP/TOUCHDOWN (glyphosate) 1 to 2 qt./acre or 1 to 2% solution.